by J.R.Myers, Constitution Party National Executive Committee At-Large Member, Founder & former Alaska CP Chairman, ACP Candidate for AK Governor in 2014, and 2016 Presidential Candidate. J.R. won Madera, Tulane & Riverside Counties in the 2016 California American Independent Party Presidential Primary Election. Former Executive Committee member and Chairman of the Montana Libertarian Party in the 1980's, and Chairman of the Montana Reform Party 1998-2003. Former Vice Chair of the Alaskan Independence Party. Opinions expressed are personal, and do not represent official Constitution Party positions. There is a growing cognitive dissonance within the minds of many Constitutionalists who have tried to find a political home within the Libertarian Party. This could also be said about those Constitutionalists who have sought refuge in the Democratic and Republican Parties as well. While initially it appears to be a good match, such Constitutionalists soon find out that there is something that's just not right about the relationship. I have been giving this some thought. The question which keeps coming to my mind is, "How is the Constitution Party different from the Libertarian Party?" This question has posed a challenge to many for a long time. In part, I think this is because we are looking through lenses fashioned by others. We need a new way to perceive the issue. Therefore, I have devised a chart to give a visual reference to my thoughts about it. 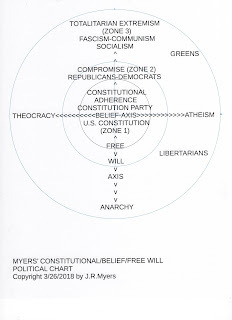 Let's call this the Myers Political/Faith Chart. It is my attempt to overcome the ancient false dichotomy of left versus right, and the clever but equally misleading Nolan Chart of the Libertarians. Although this is a first draft, I hope this helps to clarify where we're at, and why the Constitution Party is the only true political home for Constitutional Believers. The Charts have three dimensions. Where one generally falls within the charts can easily be determined by three simple answers to three basic questions. 1) The Belief Axis; Do you Believe in God, a Supreme Being, a Creator? (A)Yes, My God is the Only One Allowed & Everyone Else Must Believe Like Me Too! (Extreme Theocracy, Zealot/No Religious Tolerance), or (B)Yes, I believe in Freedom of Religion. 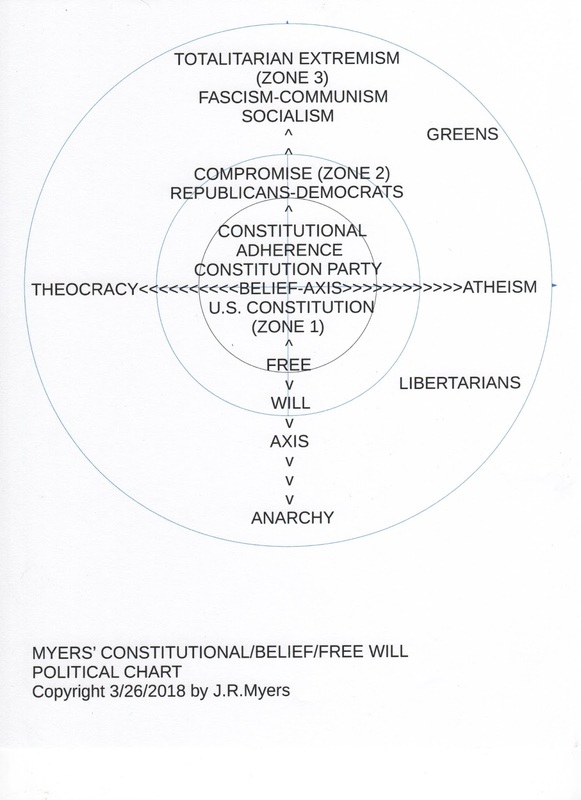 (Constitutional Centrist), or (C)No God, No Way!(Atheist/Godless). 2) The Free Will Axis; Do you believe that people should be free to do whatever they want, whenever they want? (A)Yes, always! (Extreme Anarchist), (B)Yes, most of the time. (Constitutional Centrist), (C)No, only with Permission!(Authoritarian). 3) Constitutional Adherence; Do you believe that the United States Constitution is still relevant today? (A)Yes! (Constitutionist-Zone 1), or (B)Maybe? (Compromiser-Zone 2), (C)No! (Extremist-Zone 3). 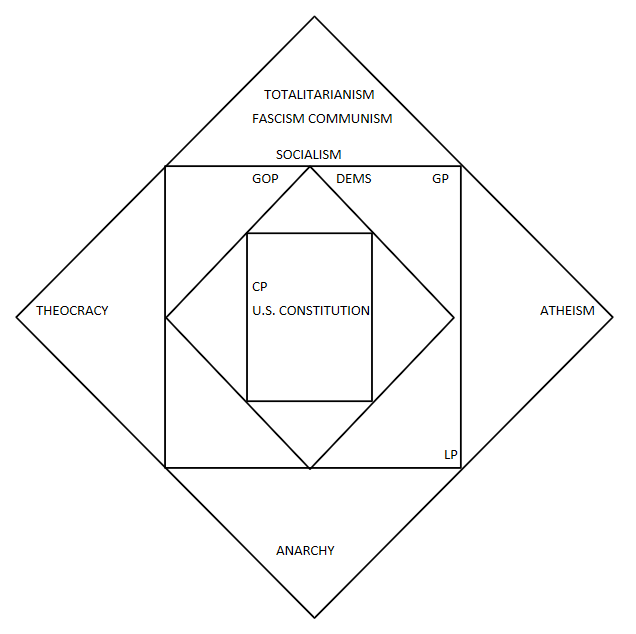 The charts are meant to be visual/conceptual aides to the Political/Faith Paradigm, and continue to be refined. While the CP and LP do share many common views, and can work together on many issues, there remains a fundamental divide between the foundational philosophies of the two parties. One is based on secular humanism, the other is based on a belief in God granted unalienable rights, and in a living Creator active in human history. This is an irreconcilable difference. This difference is most visibly manifested in the diametrically opposed positions on Life, Borders and the role of Faith in the public arena. The CP is a party dedicated to the Rule of Law as expressed by the Declaration of Independence and the U.S. Constitution. 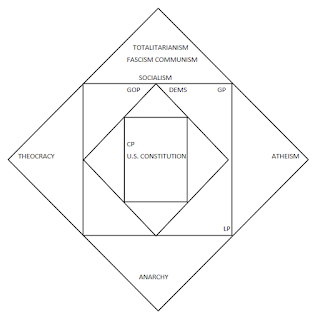 The U.S. Constitution is a balanced and centrist document. By standing on this foundation, the CP is the only truly Centrist Party. The chart is a work in progress. As a Christian patriot and Constitutional libertarian, if the Constitution Party were helping organize LCS Militia, and understood the federal income tax fraud to protect against the criminal agents of the IRS, then I would be there. And more people would be joining the CP. But as it stands now, the LP is doing neither of the above. But at least they have a better way of marketing their "wares" while maintaining ballot access ta boot...at least where it counts for me -- Texas. Howard Phillips, then later Michael Peroutka described the Ds & Rs as a political philosophy that establishes the State as god, the Ls believe Man is god, and the CP believe that God is God and He ordains civil government. US Taxpayers Party of Michigan chairman William Mohr has compared the Ls to the French Revolution while the CP is in the mold of the American Revolution. I think these distinctions are important. Let me be the first to WELCOME YOU TO THE CONSTITUTION PARTY!! If your criteria of leaving the Libertarian Party (LP) and joining the Constitution Party (CP) is the party's position of those two specific issues, then based on my understanding of where you are on these issues will force you to immediately leave the LP and join with the CP. First, there is a difference between making a position statement on the issue, and the actual engagement in the organizing of an external entity. And as you are well aware, the only purpose of a political party is to get candidates elected who support their particular platform, not the formation of other organizations/entities. "We fully support well-regulated militias organized at the state level. Further, we fully support and encourage the restoration of unorganized militia at the county and community level in compliance with our patriotic and legal responsibilities as free citizens of the United States." Here again, I'm mystified. The LP Platform is, once again, silent on the issue. "Since 1913, our Constitutional rights to life, liberty, and property have been abridged and diminished by the imposition on each of us of Federal income, payroll and estate taxes. This is an unconstitutional Federal assumption of direct taxing authority." "There is substantial evidence that the 16th Amendment was never legally ratified. When elected, we will act to cease collection of direct Federal personal income taxes. We also support ratification of the Liberty Amendment which would repeal the Sixteenth Amendment and provide that "Congress shall not levy taxes on personal incomes, estates and/or gifts." Now, I am really mystified. The CP has demonstrated, FAR AND ABOVE, that it does in fact understand the "criminality" of taxation that the federal government has foisted upon Americans by calling it Unconstitutional, while the LP is silent. We affirm the God-given legal person-hood of all human beings from fertilization to natural death, without exception. The absolute most basic right that a person has is the RIGHT TO LIFE. The Declaration of Independence lists LIFE as the first endowed right given by the Creator. Without the right to life no other rights exists. So, let me ask you, which of the party's official position on the issues reflect a more Constitutionally Correct position?? WELCOME TO THE CONSTITUTION PARTY!! When you're a large big tent party, it pays to have a platform thats vague & inclusive; since you can't make everyone happy, then making the majority happy in a way that doesn't leave out the minority is the way to go. If the LP isn't specific on certain issues that only a certain or small percentage of American voters care about -that doesn't automatically mean that it is opposed to such an issue, so it's a bit simpleton to jump to conclusions here. Why don't you simply contact the LP to find out where they stand on such issues? Btw, the LP doesn't acknowledge man as a 'deity' except for his own environment and in being free & sovereign. That doesn't mean we don't acknowledge/refuse to acknowledge the Christian god, or the god/deities of other religions, since libertarianism is anti-sectarian and stands firmly behind our founding fathers views/writings on religious liberty and the dangers of mixing sectarianism with government. Too bad the CP doesn't take this viewpoint much, and even more disappointing that certain CP state/national party officers express particular sectarian views that are quite divisive and a turn off to many voters, and especially are in opposition to what the majority of our founding fathers believed. And no- libertarianism has NOTHING to do with the French Revolution. We are not 'pro-democracy' since we don't support mob rule or the will of the majority over the minority.